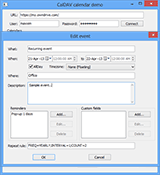 CalDAV Delphi component is a non-visual Delphi component that allows to work with CalDAV service using Delphi. The component supports Delphi 7 and higher Delphi versions. Note, since there are many CalDAV server implementations, price of the component includes adopting it to one or two servers of your choice, if needed. 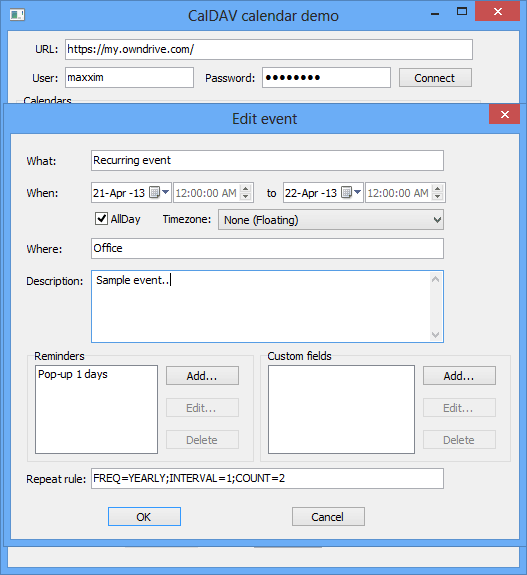 Connecting to a calendar service and showing list of events in listbox. Adding a new event "Meeting" that starts October, 12, 2010 at 10:00 AM and ends at 11:00 AM, with description "Description". Deleting an event with index number 5.